Before going in for details of health, disease and cure, few points are to be understood in proper perspective as we are dealing with living beings. Every living system comprises one or more units – called ‘a cell’. Every cell contains a living substance, the essence of which is that it differs chemically from the surrounding medium and yet maintains a DYNAMIC EQUILIBRIUM (HOMEOSTASIS) with its environment. 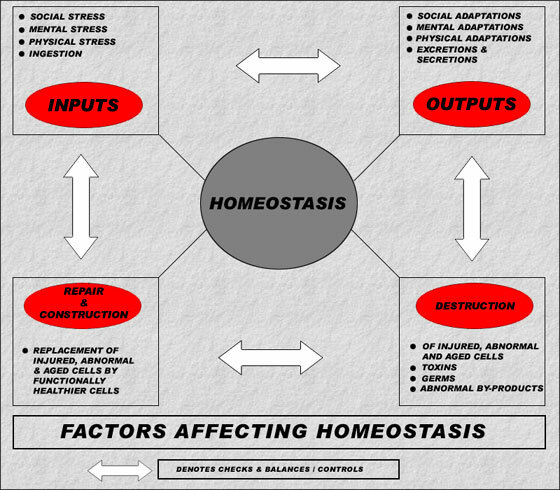 Homeostasis occurs in all living cells and in the fluids and organ systems of the multi-cellular organisms. Living systems may regulate their internal constancy despite an altered environment. And such regulation is achieved by hierarchies of controls, checks & balances, alternate mechanisms, negative and positive feedbacks etc as environmental stress is applied. In other words, when homeostasis is maintained at its optimal best i.e. integral harmonious performance of the vital functions tend to the preservation and normal development of the organism and there are no abnormal sensations and functions, it is termed health. Disease is an altered state of homeostasis and is attended by abnormal sensations and functions in the form of signs and symptoms. On one extreme, even a single disease may vary in degree of intensity, frequency and pathology according to relative abnormality of homeostasis; while on other extreme a single individual can suffer from many diseases also. Cure is reversal of the altered state of the homeostasis to its normal pattern. It is not mere mitigating the signs and symptoms but to reach the optimal best state of homoeostasis i.e. health. As march from health to disease is relative, the restoration of disease to health also occurs in percentages or degrees.